VDOE had the 2016 SOL scores in time to decide who could graduate in May. But they won’t release those scores to the taxpayers who paid for them until late Summer. So let’s look a bit harder at the data we do have. 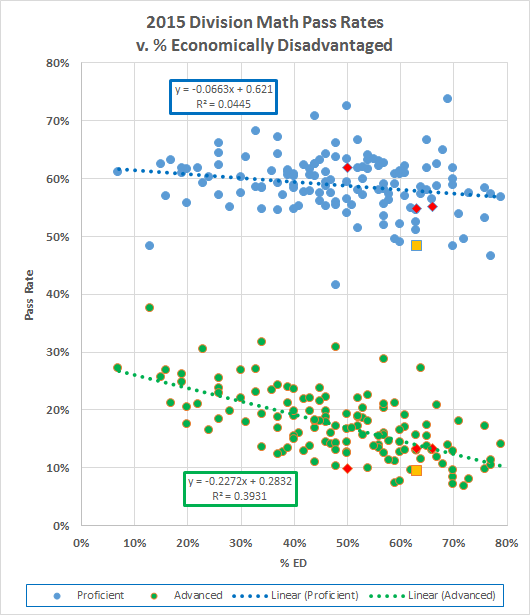 We’ve seen that division pass rates fall with increasing economic disadvantage (no surprise there). 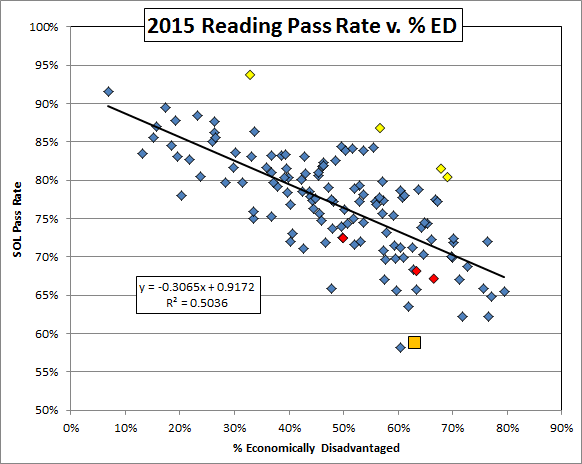 Those data also suggest that Richmond’s gross underperformance is not explained by the ED of the Richmond students. Richmond is the gold square on both graphs. 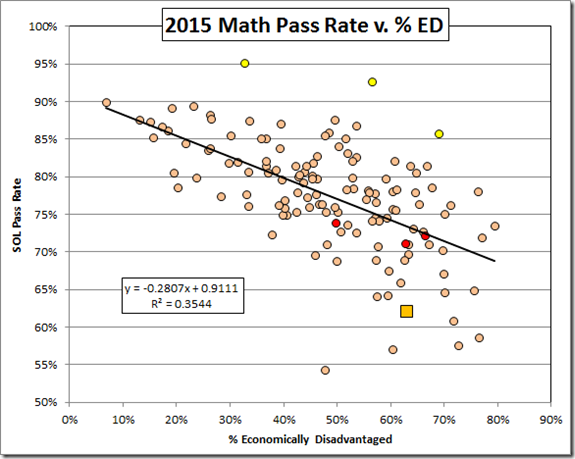 Let’s break out the division pass rates by pass proficient and pass advanced. Here are the reading data. Hmmmm. 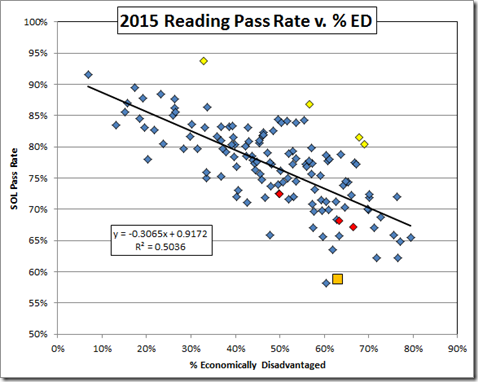 Here we see that the division reading test correlation is driven by the even better correlation of the pass advanced data. 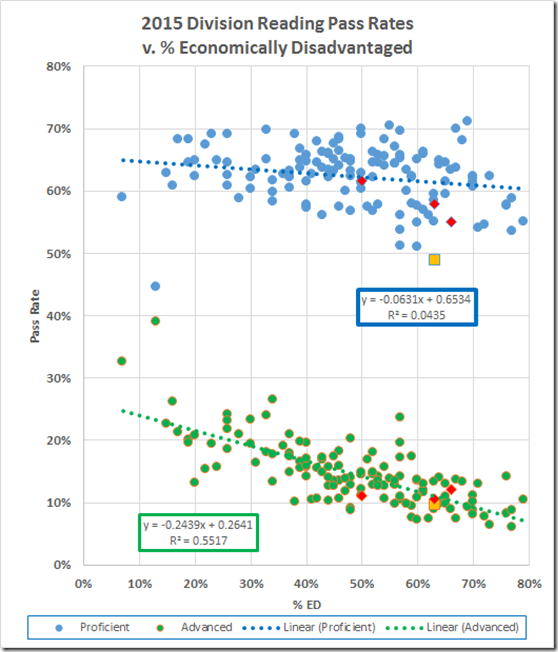 There is essentially no correlation between the pass proficient rate and economic disadvantage. As to pass advanced, Richmond, the gold square, is almost on the fitted line, and the peer jurisdictions Hampton, Newport News, and Norfolk (the red diamonds, from the left) are nearby. But Richmond is second from the bottom on pass proficient and this drags the City down to second from the bottom overall. Among the peers, Norfolk looks to underperform as to the proficient rate, Hampton is about as expected, and Newport News is in between. 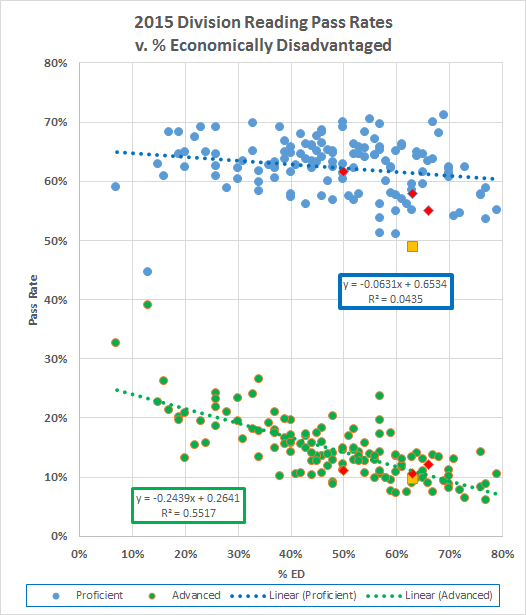 The data pair at 7% ED is Falls Church, which overperforms as to advanced and underperforms as to proficient. The data at 13% are Lexington, which does the same, only moreso. 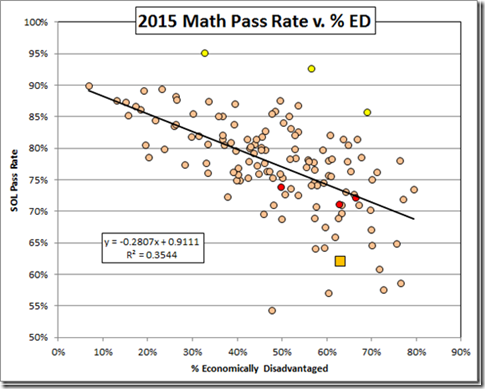 Turning to the math data, we see a similar picture except the pass advanced correlation coefficient decreases. 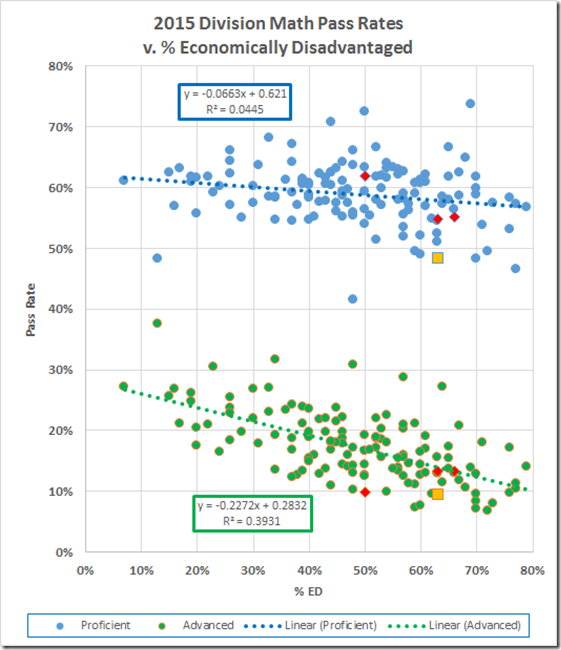 Here, Richmond underperforms as to both proficient and advanced. If RPS sensibly wants to attack its performance problem where it is worst, they will work to do a better job with the marginal students.